British filmmaker Mike Hodges made an extraordinary debut in 1970 with Get Carter, a masterpiece of neo-noir with Michael Caine as a lean, mean Cockney contract killer. Since then, who has heard from Hodges? 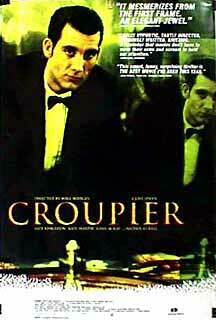 For a time, it looks like Croupier might be Hodges's thirty-years-after belated comeback, as it plunges its faltering-writer protagonist Jack Manfred (handsome and sullen Clive Owen) into the absorbing casino subculture. While his novel barely bubbles on his computer, Jack comes heatedly to life employed as a croupier, a James Bond-like tuxedoed dandy, his beautiful hands dancing poetically with blackjack cards and chips. There are inviolate rules to being a croupier, and, one by one, self-destructively, Jack violates all of them, including mixing it up with a female employee and getting acquainted, intimately, with "punter" gamblers outside of the workplace. Unfortunately, Jack isn't the only bungler of opportunity. Director Hodges throws away his film with fatuous, preposterous plot twists; and the mannered, self-conscious, voice-over storytelling (the screenwrite is ex-film critic, Paul Mayersberg) becomes more and more annoying as the story unravels, as Croupier gets crappier and crappier.